Wow, it’s been a whirlwind week around here at Page One! David and I returned from our free trip to visit the Googleplex on Wednesday morning and we’re excited to share some key takeaways from our trip. 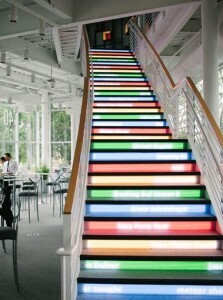 First off, the thing everyone wants to know – Yes, the Googleplex is cool! We were given a short tour where we saw things like a trending search staircase, a T-Rex skeleton collecting flamingos, international food cafes at every turn, Googlers play volleyball outside, and wide open work spaces that were made to generate creativity. 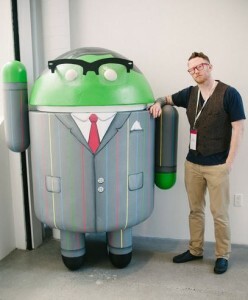 Overall you could tell Google embraces a young spirit and keeps their culture relaxed and fun. Optimizing for location – With enhanced campaigns you can alter your bids based on proximity to your storefronts. You can even use it to find new locations that will increase revenue for your business. Andy told us how Constant Contact used enhanced location campaigns with adjusted bids and realized that they were getting a great ROI in North Dakota. The legacy campaigns were not sophisticated enough to show this. Increasing mobile performance – Similar to location bid adjustments are mobile bid adjustments. Mobile traffic is gaining momentum and Enhanced Campaigns allow the marketer to alter bids to reach the on-the-go consumers so the ads more specifically speak to their needs. You also get a better understanding of the unique value of mobile consumers, allowing even further specificity when targeting that audience. Using Remarketing Lists for Search Ads (RLSA) – RLSAs bring together intent, context and audience making it easier to create search campaigns when people who have previously visited your website are searching on Google. Andy shared a couple of ways to leverage your RLSAs by increasing your bids for previous website visitors when they search for your products/services on Google. Also, you can bid on more broad keywords when a repeat customer searches on Google. This type of targeting opens up some new ways to increase visibility for high quality leads and if your site is already tagged for Google Remarketing on Google’s Display Network you already have access to use RLSAs. Neil Hoyne, Google’s Global Program Manager of Attribution, understands that the customer journey is more complex than ever. The problem, he explains, is that many marketers are only looking at the last interaction and giving that credit to the conversion. But what we forget to value is the first touch point, the second, the third, and so on. How did a website user go from dormant to brand aware to considering a purchase to actually making a purchase? This concept is extremely important – we as marketers need to be able to tell a story with a range of metrics not just high-five the last interaction and disregard the assists. When I got back from Google I was happy to stumble upon this report from Google which I was able to share with my office-mates and now you – the imagery in the report really tells the story that Neil was explaining to us. We live in a constantly connected world and now the relevance and timing of search is ultra-important to marketers. Matt Malby, Marketing Manager of Google Search Ads, explains that a purchase is the sum of many moments. These moments combine together to influence the total purchase journey. We need to be aware of how long the purchase journey is in our unique industries – for some it’s 60 days and for some it’s 6 months. When we understand this so we can position our ads to be there when potential customers are looking. In order to create relevance we need to ensure we are there at the right time of day or in the right physical location when they are searching. The last piece of this message was to always be optimized – across the customer journey and across different devices with the right messaging tailored to move them through your sales funnel. Going to Google was an experience that I’ll never forget and being able to connect with peers in my industry was exciting. It’s a good thing that David is a photographer so he could document our time there (check out those photos!). 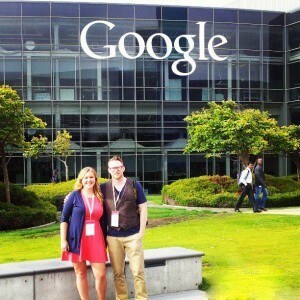 We are very excited to take what we have learned at Google Headquarters and put it into action for our clients.